Pebeo's Vitrail is a solvent based, transparent paint for creating brilliant stained glass effects on all carefully degreased transparent bases. It also creates magnificient illuminations on metal. Vitrail colors are dense and very transparent. They dry to a uniform surface and good hardness. Finished pieces are resistant to gentle washing with water or window cleaner. Vitrail Lightener — Use the Vitrail Lightener to lighten the colors without changing their qualities or fluidifying them. Relief Outliner — Apply directly from the tube with a nozzle to create stained glass relief outlines. Fill in using Vitrail colors for a convincing stained glass imitation. Vitrail Glitter Medium — Brush on the brilliance! Pebeo's Vitrail Glitter Medium brings luminous sparkling effects to painted surfaces without losing transparency. Mix Sparkling Medium into paint and apply it directly to glossy surfaces like glass, Plexiglas, and acetate to add depth, sparkle, and brilliance. Apply it directly to surfaces such as metal to obtain a reflective, glittery finish, or wood and canvas for a rich, glossy, transparent finish. Or mix it with Vitrail color and Vitrail Matte Medium to create frosted effects. Mixed Media Mixing Bottles, Set of 4 — The perfect containers for mixing, measuring, and storing colors. Suitable for use with almost any liquid art material, including all Pebeo craft paints, they're the ideal accessories for discriminating artists who like to create their own unique, specialized colors and save them for future use. The set contains four 45 ml bottles, each with a secure, airtight cap that's easy to unscrew. Vitrail Atelier Workbox Set — This innovative set comes in a new and improved plastic carrying case that opens into a fully functioning double-layer workbox full of brilliantly luminous transparent colors. The set contains 10 of the most popular Vitrail colors, as well as a Squirrel hair paintbrush, a mini-palette, a 20 ml (0.7 oz) tube of Gold Relief outliner, a sponge, and a user guide. Colors included are Deep Blue, Brown, Crimson, Orange, Turquoise, Chartreuse, Red Violet, Green Gold, Black, and Lemon Yellow. Vitrail Set of 10 — This set contains 10 colors in 45 ml (1.5 oz) bottles, including one each of Crimson, Yellow, Turquoise Blue, Chartreuse, Orange, Black, Brown, Red Violet, Deep Blue, and Emerald. Vitrail Crackling Effects Kit — Achieve an antique look in just two steps! Pebeo's Vitrail Crackling Effects transforms clear glass into an instant antique. Just 15 minutes after application, aged effects begin to appear on bright, glossy surfaces. For best results, use Crackling Effects with any Vitrail paint. When the painted surface has been allowed to dry for 1–2 hours, a uniform coat of Crackling Effects Phase 1 can be applied. After the newly crackled surface has dried (allow 24 hours for optimal crackling and drying), a uniform coat of Crackling Effects Phase 2 can be brushed over the crackled color, forming a protective barrier against wear and cleaning. The kit includes a 45 ml bottle each of Phase 1 and Phase 2 treatments, as well as a helpful instruction leaflet. 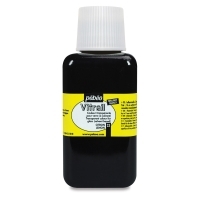 Vitrail Matte Medium — Perfect for times when you don't want transparent color, Vitrail Matte Medium is a solvent-based medium that can be mixed with Vitrail colors to obtain a flat, matte finish. Matte Medium acts as a frosting agent when mixed with any of the Vitrail colors and applied to glass or any transparent surface such as Plexiglas or acetate, allowing light to pass through the color without a "clear visual" of the other side. Matte Medium also incorporates depth into artwork through the use of multiple finishes. It can also be used alone to add translucency without color. To view a PDF of ideas for Pebeo Mixed Media, please click here. Pebeo Vitrail solvent based paint was designed to mimic stain glass, blown glass or fused glass without the expense or difficulty of working with those materials. See a demo of a stained glass application with various techniques using Pebeo products. We'll also show you some fun ideas for home decor items.